From my stepladder birdbath to birdseed ornaments, I love doing things that will make birds flock to my yard. When I lived in Ohio for a few years, we had tons of hummingbirds flitting about. Why then is it so difficult to attract birds to my feeder? Well, we get birds but not many of the cute, colorful ones. Instead, we get plenty of screeching black crows and bandit squirrels. Those cute, colorful birds don’t stand a chance. Not to mention the chipmunks who stuff their cheeks with my tomatoes and run off in glee. There I sit, tomato less, wondering what I’ll put in my salad. giving those chipmunks a little snack before the tomatoes sprout. P.S. I discovered the absolute best way to hang my bundt pan bird feeder. Well, it was actually my hubs idea – wrap twine around a tennis ball and put underneath the pan – bring the two ends of twine through the top and tie onto the tree! I didn’t just marry him for his studly good looks after all. Great idea – I’ll have to try the vaseline trick! Outstanding idea for the birdfeeder! I’m going to pin this to my DIY board! I was just researching a way to keep my small flock of chickens from spilling their feed everywhere, this is worth a try and super cute! I really love it ? Totally adorable, the perfect upcycle!! I love this idea! So cute. I wish we had chipmunks around here. We used to have tons of them on Long Island NY when I was growing up. We moved to Coastal North Carolina in the late 1990’s and I don’t think I have ever seen a chipmunk. They are so cute! Plant extra for the little buggers. Do you just refill the birdseed after a rain? I am in Florida. Luckily the rain hasn’t gotten into the feeder too much – a little wet but not swimming in water – I think the branches above protect it. Kelly, you are so clever! I love this idea… it’s just charming. I am sharing this one! What genius ideas, both the tennis ball and the bundt pan feeder! The only way I know to get rid of those nasty vermin is to have my Travis come over and shoot them with his bb gun. Probably not going to work. I know on golf courses they poison them, but that seems gross too (and maybe not safe around your tomatoes) but it might teach them a lesson. A tennis ball! So clever! I was wondering how you got it to stay like that. Pinning!! Great idea. Now, how to keep the invite list just to the hummnigbirds…. Oh my word.. so clever.. love it! Cute, cute cute! !…and what a clever idea from the hubby!….Great to have those guys around!! Just love it Kelly! The best get-rid-of-chipmunk advice? Get a cat. But they will bring their “catch” to the back door. The feeder is awesome! Would make a cute planter too. Very creative. Have you ever tried scattering moth balls to repel the chipmunks? My grandmother told me about this and it works! Those buggers would make a buffet out of my flower beds if I didn’t! Moth balls are very toxic – if a small child, or wandering dog should ingest,, it is poison. Please do not use them! This is so clever and cute! I absolutely love it! Cute feeder Kelly … just perfect to attract squirrels. I find that birds like to eat off a flat platform where they can perch and very picky about what they eat. 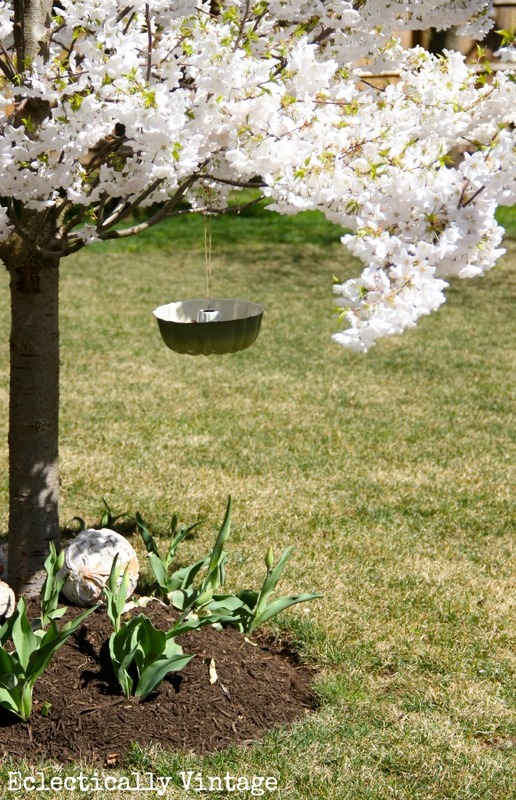 The bunt pan is a great idea, and it looks very pretty hanging in your tree but may be a little deep for small birds. 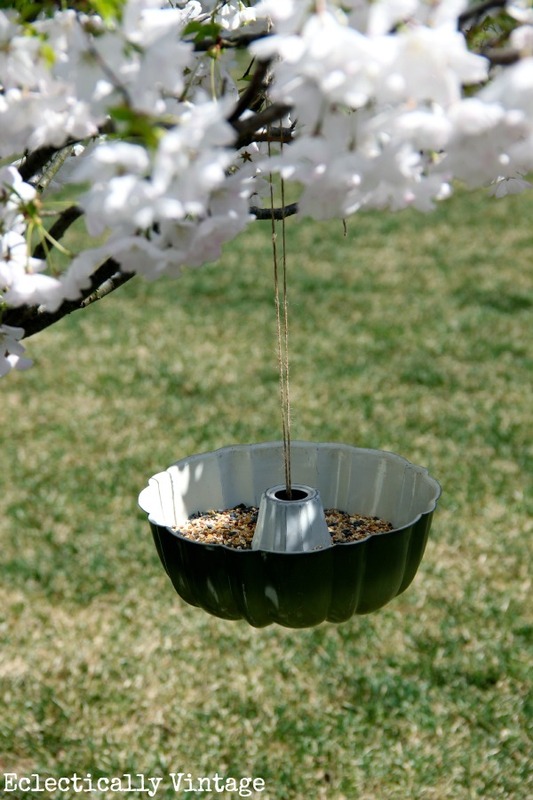 Good luck in attracting birds … we love ours and the squirrels do get their share of the seed. Thanks for sharing this idea. I like squirrels but when I found out they were eating through the wire on my bird feeders, I knew I had to do something if I wanted to have any birds. I started using Safflower seeds……………Squirrels do not like it. Therefore I have a lot of birds. 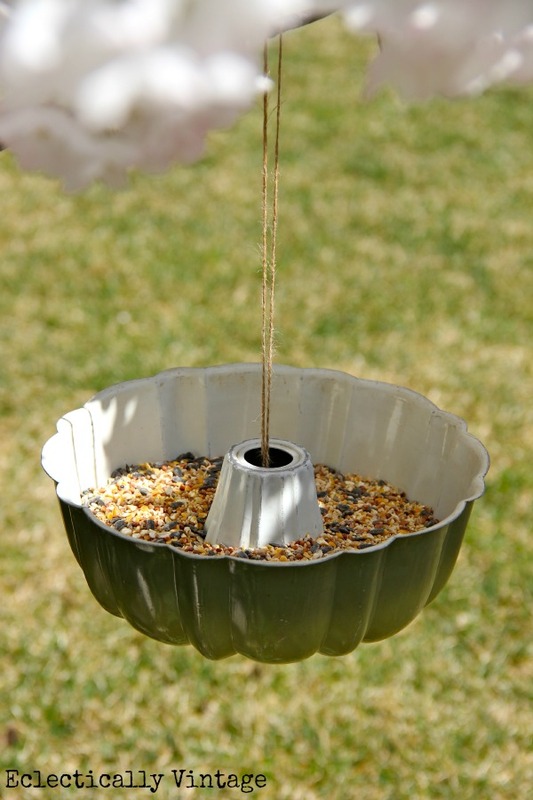 If you want a rain cover for this feeder, get a large plastic plate.drill a hole in the middle, make a not a few inches below the top of the string, slide the plate on, and……voila, covered bird feeder. A rat terrier or any treeing/herding dog will definitely keep chipmunks and squirrels out of your yard. I live in the mountains and it works for me. My cat’s also keep them out. The squirrels in our yard do not run from our cats, but do go up a tree just above the dogs’ heads to mock them. It is not uncommon to have at least a dozen of the little rascals in my tiny yard at one time. I have given up with the bird feeders and just plant stuff the birds like. Of course that means no blueberries for my cereal! What a great idea!! And it’s so cute too. Pinning!! I just love this! I love that it is simple, but that’s what makes it so great:) What a beautiful picture with the tree blooming too! I love it…I have everything from squirrels, raccoon, deer, big birds. little birds, geese (yuck), swans, ducks. Unfortunately, my squirrels would spill this, but I want to do it any way! LOVE this!! 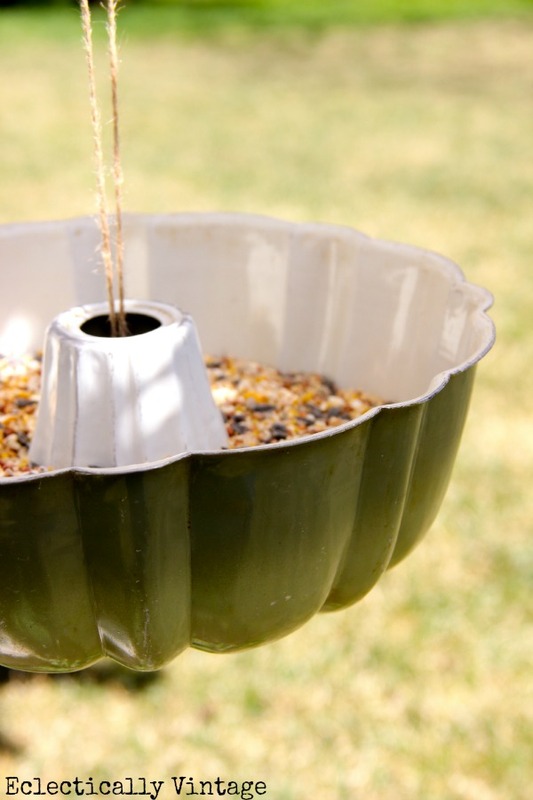 You could probably drill a couple of holes in the bottom and line with coffee filters to help with water drainage from rain and keep seeds from falling out. Cute, cute, cute!! This is fantastic, hubs is going to put it on a post for me I have just the pan! (don’t really have trees), but lots of birds! Hello Cute thing swaying in the trees! Love this! I don’t understand how chipmunks and squirrels don’t climb down to the feeder from the limb it’s tied to. Our squirrels would be in there within minutes unless there is something I’m missing? Absolutely adorable!!!!! I love everything you have on your site. Thank you for sharing all of your fabulous and vintage ideas! So you’re saying that your Bunt Pan Brings All The Birds To Your Yard? 🙂 Very Cute! I see that someone already suggested Moth Balls. They do work but have serious issues, carcinogens, kids possibly picking them up and getting it in there mouth. There is a product called Snake Away. It has the same ingredient that works in Moth Balls, naphthalene, so I do not think it is really much safer but it is in flake form. I had snakes hanging around the hot tub and they freaked me out so I bought Snake Away. It worked for the snakes but unfortunately for me, because I like the little buggers, it also made all the chipmunks disappear. Moth Balls also come in flakes and are much less expensive but I’d do some research before spreading it around. I, too, have a few chipmunks that run on my rock wall. They are cute but I always worry about them ultimately getting in my house and attic here in Ohio. So I have a Hav-a-Heart trap. I catch them, put them in my trunk and take them about a mile down the road and let them loose in a field. One year I took 29 of them for “a little ride”! Will work for squirrels, too. My dad who will be 90 this Oct had used that same technique in his own bird feeder to keep the squirrels away from the bird food. But I like the bundt pan idea as well. I see you have created ways to have little hints in you garden, as well. Do birds use the ground homes? Seems that would help cut down other garden pests too, does it? I’ve never seen any birds in them! What happens when it rains? How do you drain the water? I would like to see how it is wrapped around the tennis ball so it doesn’t” come undone as the birds are using the bunds pan. I would love to see a video of how this keeps a squirrel out and also how you’ve wrapped the tennis ball? I had to put netting up to keep the squirrels from taking one bite out of every tomato then throwing it on the ground. They are annoying fluffy tailed rats in my opinion. They drove me nuts!!! Good luck with them, netting was the only thing that I found that worked, and yes getting into my garden everyday was a ton of work… but it was worth it! Vaseline or any type of “lube” is great for discouraging the squirrels but can be bad for the birds if they get it in their feathers (and yes the birds do hit the pole with their feathers as well as hold on to the pole occasionally — think birds like nuthatches and the tufted titmouse). It can get matted into their feathers. They cannot preen this out of their feathers which can impede their ability to be able to fly – which can lead to them not being able to escape a predator. So you are trying to keep the squirrels out of your feeders but you are potentially harming the birds you are trying to feed. Hope your birds enjoy it!